You have a roof, you have the sun, and now there is a free online solar power shopping service that makes it easy to shop around for a solar power company that will give you the best bang for your solar buck. The new service is the Online Solar PV Marketplace, developed by EnergySage for President Obama’s SunShot Initiative. The goal of SunShot, which launched in 2011, is to make solar power just as cheap and accessible as fossil fuels. That includes breaking down information barriers for potential solar consumers, which is precisely what the Online Solar PV Marketplace does. The Online Solar PV Marketplace is free for both residential and commercial property owners. You start by taking a simple online survey that lets you outline the relevant details about your property. Then you list your property on the PV Marketplace, and EnergySage’s preselected network of solar companies will start bidding on your job. Instead of having to compare different forms, formulas and variables from different companies, you receive all of the bids in a clear, standard format. If you’re wondering what EnergySage gets out of this, they pick up a small commission from the solar companies. You pay nothing. The PV Marketplace is rolling out on the East Coast first, but if you’re in other regions it’s still worth checking out now (here’s that link again). Aside from providing background on the technology in plain language, the site provides information on purchasing and financing, as well as profiles of the provider companies and a helpful blog, too. 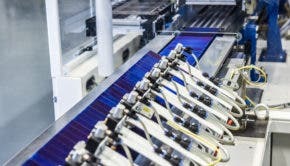 EnergySage received a $500,000 SunShot award last year for the PV Marketplace, as part of a SunShot initiative aimed at pushing rooftop solar panels into the mass market by cutting costs associated with installation. According to the Department of Energy (DOE), these “soft costs” account for about half the cost of a typical rooftop solar array, and sometimes even less. The rest includes variables like shipping, labor, inspections, permits and grid connections.